Boneless, skinless chicken breasts are a lean source of protein, lower in fat than dark-meat chicken, such as thighs and wings, and chicken cooked with the skin on. Butterflied chicken breasts are sliced almost entirely in half and then spread open, which creates a thinner cut of meat that cooks more quickly. You can tenderize chicken breasts by pounding them with a meat tenderizer. Tenderized, butterflied chicken breasts cook quickly in a variety of ways and give you plenty of options for seasoning and preparation. You don't need fancy ingredients to cook boneless, skinless chicken breasts that have been tenderized and butterflied ready to cook. Simply sprinkle the chicken with salt and pepper, and the breasts are ready to go. You can add in any other spices you enjoy, such as cumin or chili powder. Create your own spice mix, rather than using a prepared mix, to cut back on the amount of sodium in your diet. Or marinate the prepared chicken breasts in your favorite marinade, such as a combination of citrus juice, garlic and olive oil, to add more flavor to the meat. Add an extra boost of flavor to plain chicken breasts by stuffing the meat with savory ingredients. It's easy to fill butterflied chicken breasts with cheese or a piece of prosciutto or jamon serrano before cooking. Just stuff the middle of the breast with the filling, then close up the chicken breast around the cheese or ham. If you're watching your sodium intake, leave out the cheese or ham and instead fill the chicken breast with fresh herbs or vegetables, such as asparagus or mushrooms. Boneless, skinless, butterflied chicken breasts cook quickly on a gas or charcoal grill heated to medium-high heat. Grilling adds a smoky flavor to chicken. For indoor cooking, a hot saute pan cooks butterflied boneless chicken to golden perfection. 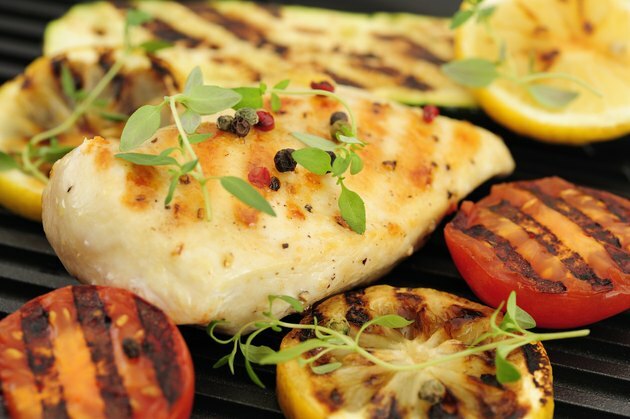 Whether grilling or sauteing, flip the chicken breasts halfway through the cooking time. Use a meat thermometer to check your chicken for doneness. Pull the breasts from the grill or stove when the internal temperature reaches 165 degrees Fahrenheit to reduce your risk of food-borne bacteria. Cook, marinate and dress boneless, butterflied chicken breasts with a heart-healthy oil, such as olive oil or canola oil, in place of less-healthy fats, such as butter or peanut oil. Serve cooked chicken breasts with steamed vegetables and a whole grain side dish to create a complete, balanced meal with plenty of protein, fiber and nutrients. Lauren Groveman's Kitchen: Nurturing Food for Family and Friends; Lauren Groveman, et al.